With a better understanding about the importance of water flow, reef aquariums are getting treated to all manner of water moving equipment, including both internal and external pumps that pulse back and forth to simulate natural currents. The common denominator to most of these solutions is increased electrical usage, which doesn’t bode well for aquarium keepers who are constantly on the hunt to make their hobby more affordable. Trying to tease even more efficiency out of their pumps, aquarium keepers resorted to devices like penductors, which use the physics of water movement to induce additional water flow out of a specialized nozzle without adding any quantifiable amount of energy consumption to the pump. These have been fine and dandy for those just looking for more gph, but the crew at LSS Laboratories has released a specialized set of penductors, called Super Wave Accelerators, that add more than just flow rates…they add various types of water movement as well. Going off the same basic principles of penductors, the minds at LSS have made some interesting alterations to these water accelerating devices that now cause pulsing and oscillating water movements. Coming in at six different models each with their own type of flow, the SWA penductors will bolster water flow while fitting into your specific flow scheme nicely. The video above does a great job demostrating each of these devices, but keep in mind that the penductors really only work while submerged. So the video doesn’t show them anywhere close to their achievable speeds. Instead, it’s meant to just show the flow patterns. 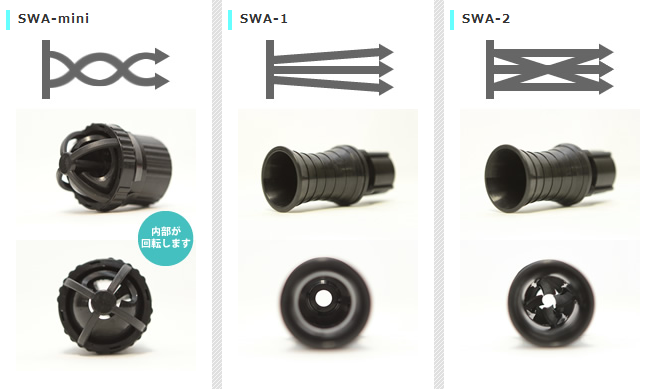 The price range for these SWA fittings starts at $15 and climbs to $25 for the largest model. Various adapters and fittings are also available on the LSS website that help connect the wave accelerators to your plumbing and get the water where it needs to go. For the control freak in all of Us. Does anyone know where these can be purchased from? I can’t seem to find a link to order on their web site. It’s mainly Japanese.